One of the cooler things about living in one town your whole life is you get a chance to promote really fun events and fundraisers for your alma mater. By the way, the term Alma Mater makes me feel like I am 92...how about, the lovely institution that I received my high schooling at is having its Annual Golf Tournament? Its July 25th at the Riverbend Golf Course and is for a great cause-the Seabreeze High School Football Boosters. If you are a golfer, and live in the Volusia County area, won't you think about supporting Seabreeze High School Football Boosters? It's a GREAT school clearly, look how me and my friends turned out! 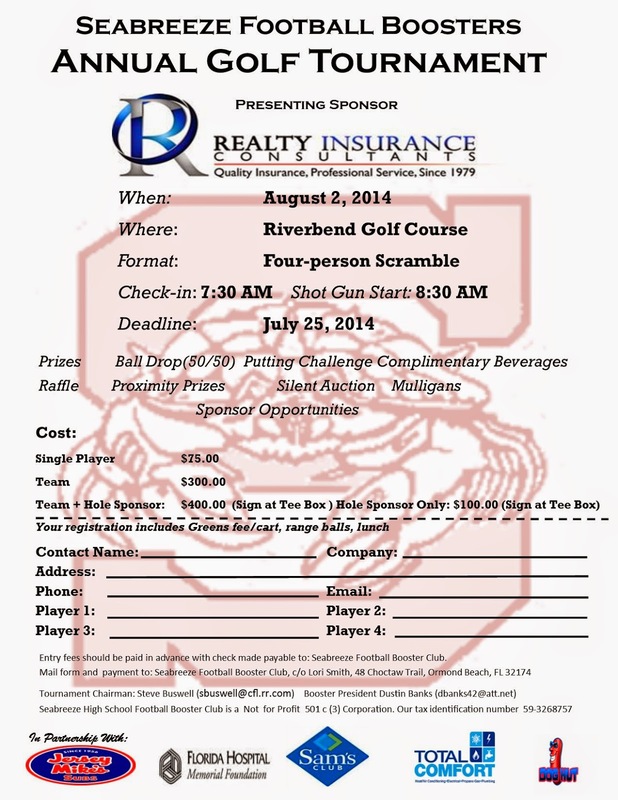 Mark your calendars for the Seabreeze Football Booster Golf Tournament (Presented by Realty Insurance Consultants) on August 2, 2014. We need help from all Sandcrab Nation to make this event the best ever!!! They are holding an organizational meeting June 19 at the New Houligans at Destination Daytona at 7:00PM.